Can we make Unite a fighting union? 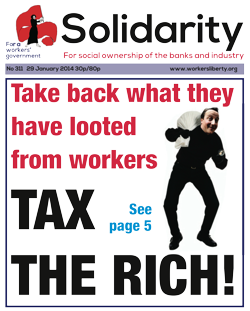 Take back the wealth, tax the rich! Mobilise against the EDL in Slough! All aboard the 3 Cosas bus! University bosses to dock strikers' pay? Let asylum seekers into Australia! As we write on 27 January, the political flux in Ukraine has reached a level where a wide range of dramatic outcomes look possible. Town halls in many areas in the west of the country, and some central ministries in Kiev, have been seized by anti-government protesters and barricaded. According to the BBC, the protests have now spread to the east of the country, previously thought to be the government’s main base of support. On a chilly Thursday morning in late January I found myself standing at the entrance to an ultra-modern building that looked exactly like a shopping centre or hotel. An immense atrium, mirror-like glass everywhere, it was certainly designed by architects with ambitions. The building was the main courthouse in downtown Istanbul — the largest courthouse, we were told, in all of Europe. Unite is the UK’s largest trade union, with approximately 1.5 million members in industries as diverse as cabin crew, speech therapy, power stations, and car production. It has 100 full-time organisers, organising workers in mainly unorganised workplaces and industries. Its General Secretary Len McCluskey boasts that he has never blocked or repudiated a strike during his tenure and its “leverage” campaigns have seen noisy protests and intense lobbying beating the likes of Honda, London Buses, and major contractors and firms in the construction industry. Click here for more info and to buy the book online. The AWL’s new book, In an era of wars and revolutions, brings together cartoons published by revolutionary socialists in the US between the 1920s and 1950s. Below Sacha Ismail discusses the cartoons that deal with the oppression of African Americans and black liberation struggle. Here are a few of them. Janine Booth’s new book, Plundering London Underground: New Labour, private capital and public service 1997-2010 examines the Public-Private Partnership (PPP), which was dreamed up, and imposed, but also faltered and collapsed, within the term of Blair and Brown’s Labour government. The top ten per cent in Britain pocket over £300 billion a year. Just a ten per cent tax bite from that flow would be enough to offset all the cuts that the Government is making. Yet shadow chancellor’s Ed Balls’s minimal proposal to tax fewer of the rich, and more lightly — to raise the top income tax rate from 45% to 50% — has brought an outcry. Digby Jones, former chief of the bosses’ federation the CBI, and briefly a minister in the last Labour government, squealed that it meant “kicking” those who “create wealth and jobs”. As Matthew Thompson suggests (Solidarity 310) most religious people today in Britain have retreated from the claims which, historically, all major religions made to explain the world and the cosmos. But they try to keep the cherry orchards for themselves. Science can deal with astronomy and building bridges and treating cancer, but religion still claims to rule on what is right and wrong. After Liberal Democrat Maajid Nawaz tweeted a cartoon from the satirical web comic ‘Jesus and Mo’, along with words outlining how he, as a Muslim, did not find it offensive, the response was disappointing, but predictable. Dozens of people (including liberals and of course, that great champion of freedom so long as it isn’t in Iran, Cuba or Syria, George Galloway) expressed outrage at Nawaz’s actions, many of whom are demanding that he be recalled as Prospective Parliamentary Candidate for Hampstead and Kilburn. Stephen Velychenko’s analysis of events in Ukraine (Solidarity 310) is selective, simplistic and kitsch. It writes large national minorities and the working class of Ukraine out of existence. Ukraine is a vast area with no “natural” borders. It has always had a diversity of identities and languages. The industrial Donets Baisin (Donbas) region in the east of Ukraine has had a mixed Russian and Ukrainian working class going back to the 19th century.